Tired of seeds falling into your food? 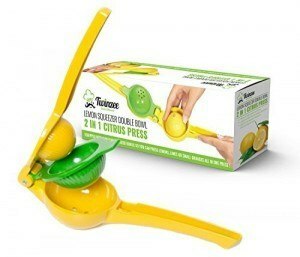 Hate the mess from squeezing lemons with just your hands? Hate changing squeezers for different fruits? Now with the “Twinzee” 2 bowl citrus press, you can easily take the juice out from different fruits and even different sizes. Why Twinzee Built in 2 Bowls in 1 Lemon Squeezer ? HASSLE-FREE JUICING EXPERIENCE:The double-bowled design of the Twinzee citrus press allows you to take out juices from limes, lemon, and oranges from a single gadget. The small bowl can be used for limes and lemons. If you want to juice out oranges, grapefruits, and large citrus fruits, then use the bigger bowl. SAVES TIMES: The citrus press is a handy tool when you are in a hurry or want to make a mixed citrus juice. Just put two different fruits in the two bowls and press to take out the juice. EASY TO USE: Taking out juice has never been this easy. Just three quick steps and you have pure juice without seeds or pulp. EASY TO CLEAN AND DURABLE: The citrus press is made from a durable material which is unbreakable. The tool is also dishwasher safe. WE STAND BY OUR PRODUCT: The Twinzee citrus press is backed by a Hassle Free, Premium Lifetime Replacement Guarantee! Click The “Add To Cart Button” Now – RISK FREE – To Get Your Favorite New Twinzee Double-Bowled Citrus Press Today! 100% satisfied customers, and you ?